3 double bedrooms, sleeps 6 . 2 bathrooms, 2 separate WC. We are a British family living in Switzerland for a number of years, originally here for work but now that the children are grown and have established their own families, we are enjoying watching the grandchildren develop as bilingual Europeans. Holidaying in the region some years ago, we noticed this development of new houses being built and thought they looked interesting and above all, in a wonderful position. The following year they were nearly completed and we decided to look round one of them, which resulted in us having long discussions about how to afford the upkeep and maintenance. We have never regretted what was a fairly rash decision! The house is in a wonderful village, with easy accessibility, a gentle stroll to the shops, restaurants, market and the perfect place to watch the world go by. We have furnished it as our own home, because that is what we wanted, a home-from-home and we hope all our guests feel that too. For those with a more energetic bent, there is wonderful walking in the hills, particularly in the Spring, when the thyme and rosemary are in bloom. no fixed line. Mobile reception good. outdoor drying lines. Indoor portable dryers. space for two cars, one under cover. Live box, (Fr Orange) with wifi . Live box (Orange) with wifi connection throughout house. comprehensive range for all situations. Plunge system. Espresso electric machine. separate kitchen with facilities as listed. CD player with wide choice of music CDs . Large library of English language fiction and local information. CDs covering popular and classical music. Outdoor and indoor toys for younger children. Private garden with flower beds and larger area laid to gravel. Coal fired BBQ with cooking tools etc. 3 bedrooms with 6 beds. 2 rooms arranged as double beds. Child's cot available. internet connection available, cable/wifi. telephone for local calls only Our housekeeper is responsible for seeing you in and out, control of security deposit, cleaning and laundry. We request you to leave all cooking and eating utensils cleaned and stored and to take used bottles and newspapers etc to the local recycling centre. We had a lot of fun and visited a lot of cities in the surrounding area. We like this house as before. It is very quiet and yet central. Gladly again and again. Stayed four weeks here through Autumn into early winter. Lovely house in a great situation for the village, in a beautiful part of France. Loses a star because there is no oven - combi microwave - and only British television, but these are not major issues. Excellent overall, very comfortable, and we would happily return. BBQ in garden for oven type cooking. We stayed in this well equipped, clean and comfortable house for a week. It is set on the edge of the village, only 5 minutes' walk to the centre, so is both peaceful and convenient for all amenities. We appreciated having access to the garden as the weather was good for most of our stay. Arrangements with the owner were smoothly managed. His friend was waiting to pass on the keys and provide all necessary information. She responded very promptly to our call when we had a slight hiccup with the plumbing. A plumber appeared quickly and resolved the issue with no fuss. Excellent service! I would have no hesitation in recommending this property to friends and family. We stayed one week at this wonderful home. Plenty of room inside and a peaceful patio out back. Friendly cats drop by for visits. 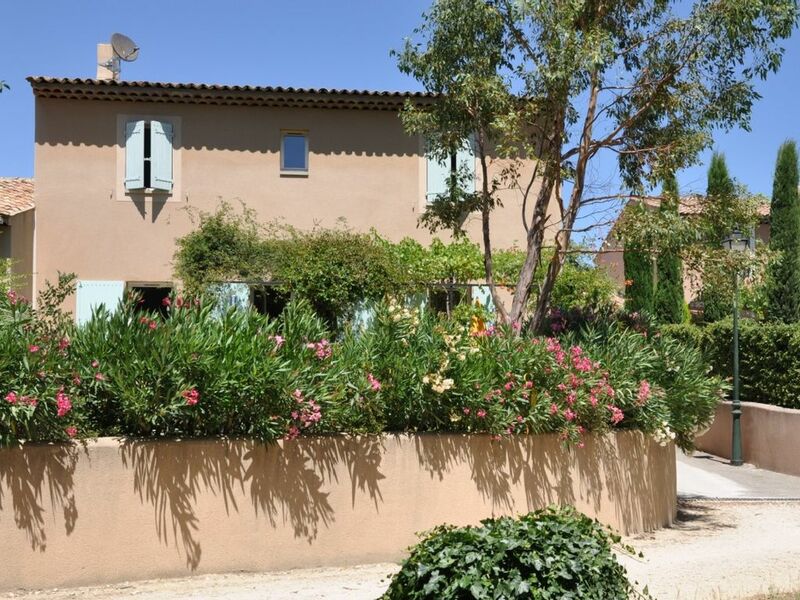 It is an easy stroll on a footpath to the centre of Lourmarin, which has a number of nice restaurants and shops. Hope to return soon! We stayed for 6 nights. What a wonderful house. An easy walk 5 minute to the village. Lourmarin is a wonderful spot and flat, so easy to get around. Great base to explore the Luberon. We loved it. Lourmarin, lively village south of Luberon mountains, set amid vines, olive groves. In village, galleries, restaurants, weekly market, castle with arts centre during summer months. Luberon National Park to the north, Med. coast, Camargue region and lower Alps (Canyon du Verdon) all about one hour. Aix en P, Avignon 30 mins. 25 pcent deposit required to secure booking. Balance due 4 weeks prior to rental period. Payments accepted either using PayPal (e-mail Euro transaction) or direct GBP bank transfer. Details sent with reply to enquiries. . For lets of more than 3 weeks special deposit conditions apply. Please ask for these details when making your initial inquiry.